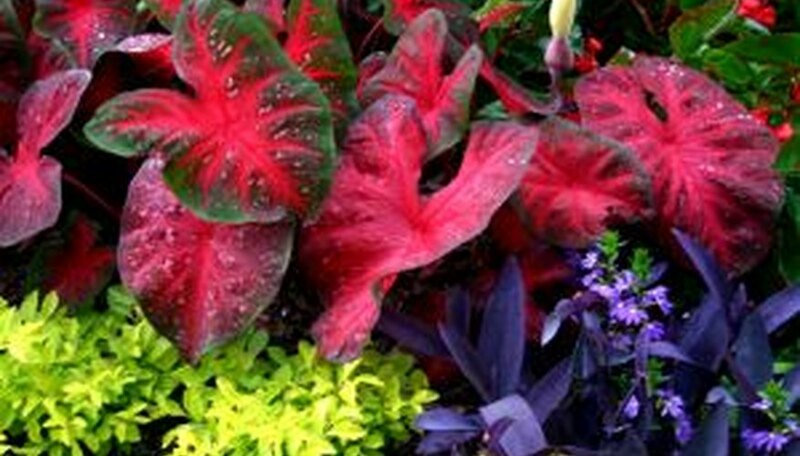 Grow caladium outdoors or in containers for its large, colored foliage. The leaves of these tropical plants range from 6 inches to 2 feet long, depending on the variety. The variegated coloring is most often green with pink or white on the inner part of the leaf. Caladiums prefer shade, and in mild climates with no winter frost, they may be grown outdoors year-round. Otherwise, plant caladiums in containers or dig up the bulbs and bring them in before winter frost. Plant caladium bulbs in a container or garden bed in shade or partial shade. Improve moisture retention by working peat moss into the bed or potting soil. Plant in full to partial shade with the eyes on the bulb facing up. Plant so the top of the bulb is 1 inch to 1 1/2 inches beneath the soil surface. Keep soil temperature at 70 degrees or warmer. Cooler temperatures lead to bulb rot. Apply a 3-inch layer of organic mulch, such as bark or wood chips, around caladiums. This preserves soil temperature and moisture. Apply fertilizer to the growing beds or containers every four to six weeks during the spring and summer growing seasons. In most conditions, 1 tbsp. of 5-10-10 fertilizer per square foot or per container is sufficient. Water thoroughly after applying fertilizer. Keep soil moist at all times. Regular watering at least two times a week is sufficient unless conditions are particularly dry. Store bulbs at room temperature in a dry area until planting. Add a general-purpose fertilizer when planting bulbs to improve poor soils. Removing any blooms will lead to healthier, more dense foliage. Too much sunlight leads to leaf browning. Remove dead or damaged caladium leaves to avoid leaf rot. Avoid getting fertilizer on caladium leaves, as this will burn them.